Co. Cork: Ahern, Ardnageehy, Ballyhooly, Ballynoe, Castlelyons (2), Castletownroche, Derryvillane, Fermoy (4), Glanworth, Kilcummer, Kildorrery, Kilgullane, Killatty, Kilworth, Knockmourne, Macrooney, Marshalstown, Mitchelstown (2), Mogeely, Pharihy, Rathcormack (2), Templemologga. The Board also included 9 ex-officio Guardians, making a total of 36. The Guardians met on alternate Saturdays. The population falling within the Union at the 1831 census had been 85,005 with divisions ranging in size from Kilgullane (population 1,196) to Fermoy itself (9,524). 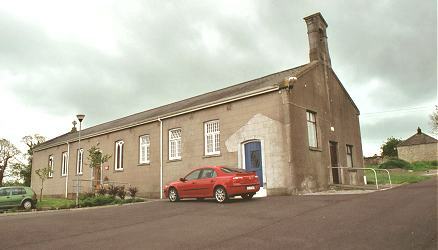 Unusually, the new Fermoy Union's workhouse was not purpose-built, but an adaptation and extension of an existing barracks building. Under the supervision of the Poor Law Commissioners' architect George Wilkinson, the reconstruction scheme was to accommodate 900 inmates. Its construction cost £3,251 plus £1,148 for fittings etc. The workhouse was declared fit for the reception of paupers on 10th June 1841, and received its first admissions on 6th July. During the famine in the mid-1840s, a store-house was hired to accommodate 150 extra inmates, and a shed erected to hold a further 50. Fever patients were initially dealt with in hired premises until a 75-bed fever hospital was erected. Despite these efforts to increase capacity, new admissions — whether sick or healthy — were crowded into alread overfull wards, with up to five sharing a bed. On one occasion, thirty sick children were found occupying three beds (O'Connor, 1995). In 1852, the second biggest town in the Union, Mitchelstown, became the centre of a new union, taking in the northern part of the Fermoy union, together with parts of the Kilmallock and Clogheen unions. 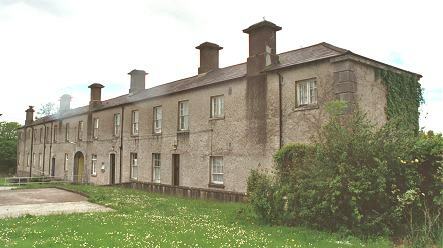 In 1857, despite having lost part of its territory, Fermoy erected a new workhouse on a 17-acre site at Strawhall about a quarter of a mile to the east of Fermoy. It cost £18,000 and could accommodate 700 inmates. The new workhouse site location and layout are shown on the 1905 map below. Fermoy new workhouse site, 1905. The new buildings followed a rather different layout to the designs used in the earlier Irish workhouses. The Dublin offices of George Wilkinson, the architect of virtually every union workhouse in Ireland, had been been closed in 1854 and it is not clear whether Wilkinson had any hand in the design of the new Fermoy building. 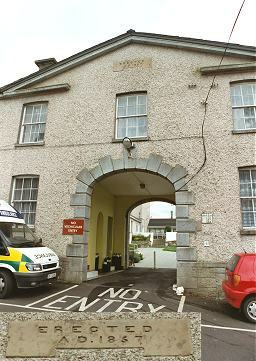 The workhouse's entrance and administrative block at the north had a central archway, a feature found in some of Wilkinson's later designs, for example at Thomastown, Castlecomer and Mitchelstown. This block probably contained a porter's room and waiting room, the Guardians' board room, and possibly school-rooms. To the rear, instead of the usual central dining-hall and chapel block, a walled thoroughfare completely divided the site, presumably into male and female sides. At each side stood a three-storey accommodation block. From the 1905 map, it appears that the western block included hospital accommodation. Further parallel blocks lay to the rear and included a fever hospital at the west, and a chapel at the east. 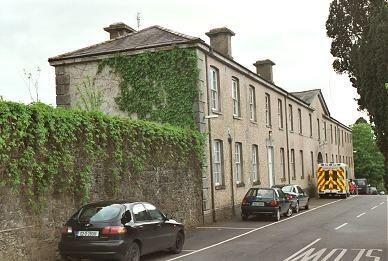 In 1863, a Turkish bath was installed in the Fermoy workhouse after the union's Medical Officer had visited an existing one at the Lismore Union workhouse. His reports on the matter are reproduced below. The Turkish bath consists essentially of heated air applied to the surface of the body, the effect of which is at first an increase of the insensible perspiration, and gradually a softness and moisture of the skin ; finally, a general and copious perspiration breaks out. After the continuance of which, for some time, the body is douched plentifully with tepid, and lastly with cold water; the refreshing and invigorating effects produced by the latter steps of the process are best known to those who have personally experienced them. The bath, as usually constructed, comprises three compartments, the outer room, of the temperature of the external air, the middle room, heated from 100° to 110°, and the inner from from 120° to 140° In Lismore, there are but two apartments, one of the temperature of the outer air, or rather a few degrees above it, from its proximity to the hot air room ; the hot room averages about 120 degrees, and appears to work satisfactorily at that temperature. The whole has been got up at a cost not exceeding 50l. 1st July 1863.—The Turkish bath has been in almost daily use for the last fortnight, and I am happy to state that its use has been attended with marked benefit in several cases of chronic rheumatism and skin diseases; a great many of the able-bodied of both sexes have also availed themselves of it. The nearby Midleton and Lismore unions also installed Turkish baths, as did the Cork and Limerick District Lunatic Asylums. Many of the old workhouse buildings, particularly on the western side, have now been demolished. The site is now (2002) the home of St Patrick's Community Hospital. Cork City and County Archives, 33a Great William O'Brien Street, Blackpool, Cork. Holdings: Board of Guardian Minute Books (1870-1); Receipt and payment book (1918-25).